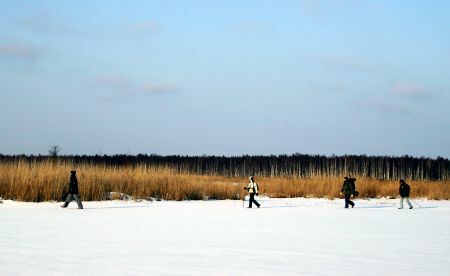 Endla Nature Reserve is one oft the most famous bog areas in Estonia. The Endla Nature Reserve was established in 1985 to protect the best preserved central part of the mire system and karst springs of the southern slope of the Pandivere Upland. It´s necessary to register Your visit at Tooma, where Nature reserve center is locating. Call +372 77 63375. This track starts from N58°52.5963' E026°16.3836' - this is parking place in front of Tooma nature reserve center. Important to track followers - as this track is recorded in winter time, You can not follow it exactly at summer time, as we crossed lakes and swamps. You can follow the track from coast or use a parts of it to follow from start or End-camp. Google Map - track and waypoints. TOWER1 - N58.875897 E026.247331 - Watchtower. JUTAKIVI - N58.861290 E026.206397 - Hut, for pre-registered hikers only with sauna. KAERASAA - N58.861383 E026.136667 - abandoned farm house. LAKECAMP - N58.862380 E026.146587 - Camping place near Sinijärv Lake. END-CAMP - N58.871230 E026.103973 - Camping place on the side of Norra Springs.